Think about it. How many dioramas and vignettes have you seen on contest tables that just look too 'clean' (even with rubble)? Even so, you just can't put your finger on what's missing (good thing too, or you might have to wash your hands). Trash. Garbage. Waste. Keep a group of people in one spot for any period of time and they begin to generate a trash pile. In the modern battlefields, you have a variety of tell-tales that are distinctly different from other time periods - plastic water bottles, plastic trash bags, colorful food cartons, etc. 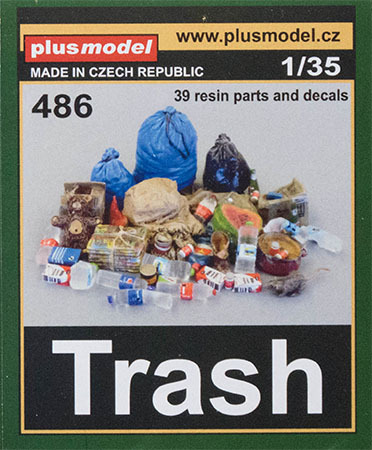 Plus Model has created this interesting set to help you trash your next project. This set is cast in gray and clear resin and provides 39 parts including plastic water bottles in various conditions, glass bottles, trash bags of various shapes and sizes, cartons, a discarded pot, and even a stack of newspapers neatly bundled. This set includes a set of decals to help you label the relevant items before you weather them and put them into your scale scene. Grab one or more of these interesting sets to add that missing dimension in your diorama or vignette! My sincere thanks to Plus Model for this review sample!